Pictured center seated HCEMS Captain Darlene Poole, left to right back row Captain Brian Bricker, Lt. Brandy Rogers, HCES PIO Amy Maxwell, HCEMS Deputy Chief John Combes, Lt. David Burdett, and Director Ken Wilkerson. 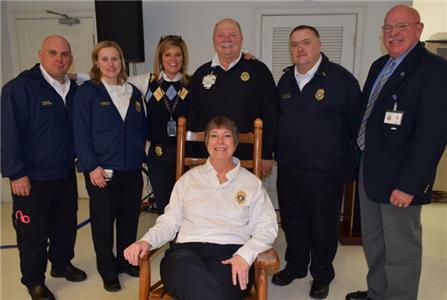 Hamilton County Emergency Medical Services (HCEMS) honored HCEMS Captain Darlene Poole recently at a retirement celebration for 30 years of service to the community. Captain Poole was one of the first employees hired to serve in the Hamilton County Emergency Medical Services. She began her career in 1988 as a paramedic with HCEMS which began with two ambulances. The county now has 14 ambulances strategically placed throughout Hamilton County. Captain Poole retired as captain of the Training Division of HCEMS. She has led training for countless individuals in HCEMS, local and area fire departments and the Hamilton County Sheriff’s Department among other agencies requiring certification training. She has served on the Southeast Emergency Medical Services Directors Association (SEEMSDA) committee for several years and was instrumental in organizing the annual HCEMS Pink T-shirt campaign, bringing breast cancer awareness to the fore font in the community. She has been responsible for coordinating all re-certifications for HCEMS personnel and serves as an instructor for Advanced EMT and Paramedic courses at Chattanooga State Community College for both state and national certification and licensing. For more information about HCEMS, visit www.hamiltontnems.org.